With keypad code entry as well as up to 12 intercom buttons, these Videx Professional Audio Intercom & Keypad Entry systems provide a means for both visitors and occupants to gain entry without the need for keys. 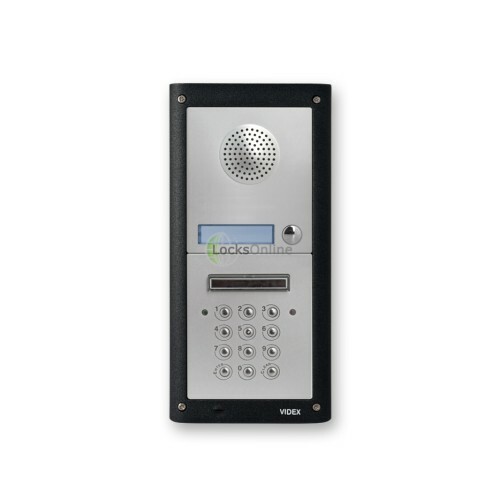 It also allows you to give access codes to delivery drivers and couriers so that they can gain entry through your gate or main communal door, to allow access to the property if you should wish to. 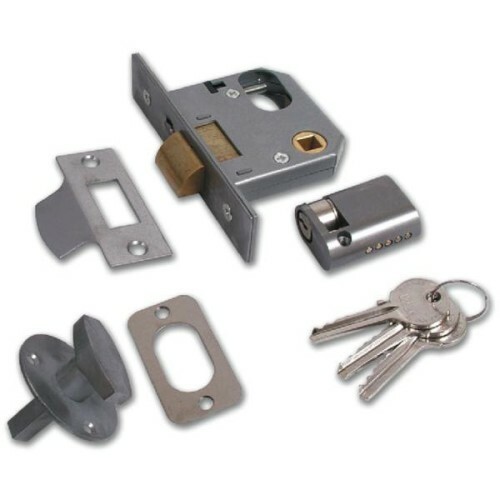 As these are modular form kits, the system comes in multiple modular components mounted in a main housing depending upon how many buttons you require. Each module is built to a high standard with stainless steel fascias and illuminated nameplates for each of the call buttons. The keypad also features an illumination strip situated just above the keys as you will see in the photos, which beams light over the keypad to aid code-entry outside of daylight hours. 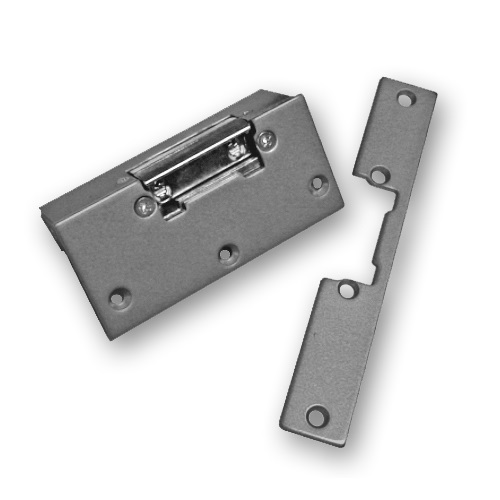 The main housing body is a single-piece cast aluminium construct providing a robust and hard-wearing install. For this reason, these professional Videx kits are a popular choice for intensive use such as in commercial and industrial installations. 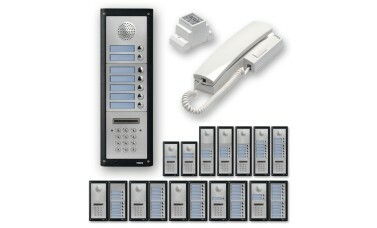 For each button you have a handset for the flat, office or area that the button represents. 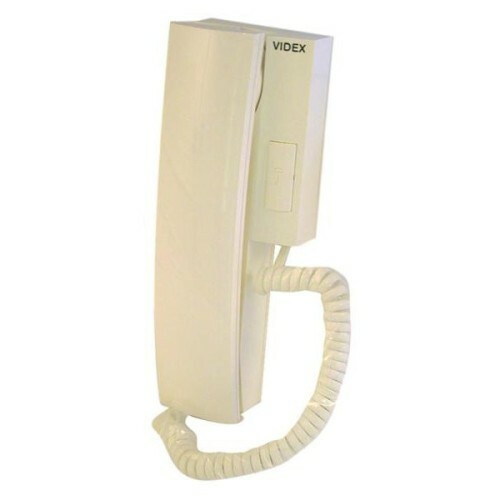 This can be increased to up to three handsets per call button - so if you have a call button for a large apartment, a warehouse or anywhere else where multiple handset locations would be of benefit, you can do that with these systems no problem at all. 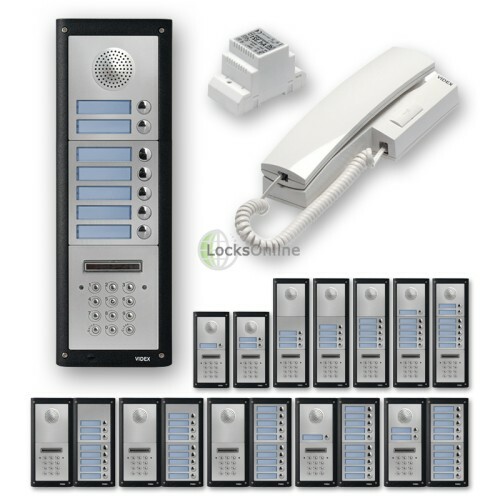 And each of those handsets then would have the ability to release the door (although technically speaking, you could not wire in that element on certain handsets if you wanted to restrict the ability to audio conversation only with no lock release method for particular handsets for any reason). The keypad on these systems has some very powerful functionality behind it. On first glance it is just a keypad, with just three programmable codes. But once you take a look at the terminals on the back you'll see that this keypad offers some functionality that is very uncommon to say the least, and has some huge practical advantages. Each of the three programmable codes on this keypad operates its own physical NO/NC relay. This is a fantastic feature that you will not find easily from another keypad. In addition to this, each relay has a PTE (push-to-exit) input, which can be used to trigger the relay from other third party devices - push to exit buttons primarily but these can also be used for a whole host of solutions - it all depends what you need! The keypad also has the ability to accommodate varying code lengths for different levels of security. 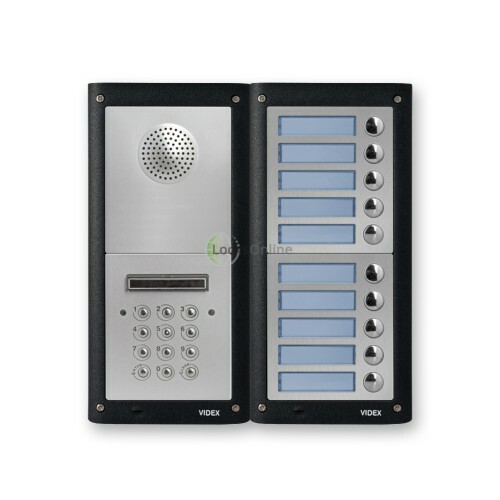 As standard most people choose to go for a 4 digit code much like a PIN number - however the Videx kits here offer up to 8 digit lengths for added security should you need it. And although the keypad is limited to 3 codes only due to the individual row of relays for each code, in most set-ups when occupants are to use a code it is commonplace for everybody to share the same code - and it's rare in this case to need more than one or two codes, so in this instance Videx have designed this series to accommodate 3 codes as a practical measure to facilitate most needs. With these kits the minimum size is always 280mm in height and 135mm wide based on two-modules - one for the speaker panel which can accommodate 2 buttons also, and another for the keypad module. In addition to this, you can then have up to 10 more buttons (which including the two on the speaker panel allows for up to 12 buttons). 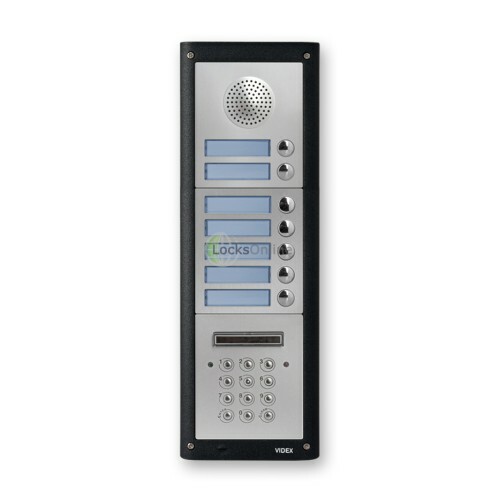 Each button module can offer up to 5 buttons, so if you require between 3 and 7 call buttons you would have a three-module system (speaker + 2 button, 1-5 additional buttons, and the keypad) - taking you up to a 400mm tall unit. Beyond this, once you require between 8 and 12 buttons, the modular panels sit side-by-side instead, shrinking the overall height back down to 280mm but doubling in width up to 86mm (give or take a few millimetres of tolerance on these figures of course!). The photos shown here should help you make sense of this setup. Supplied with a 12v AC power supply capable of providing a constant 1.3Amps, the unit itself will only consume around 200mA (plus an extra 50mA for every additional button module), leaving plenty of additional power supply for the likes of an electric release or third party peripheral device. And if you need a bit more power than that, you can also use the dry relay contacts on the unit to use your own separately powered devices along with this system. Please note that all of the flush-fitting kits and all kits exceeding the basic 1-button kit are available only by special-order and may take a few extra days to be dispatched.